Adding together some extra rotation is a sure shot fire way of stepping up a move that you already have mastered, and the double back roll transition is definitely up there as one to learn, so here it is. 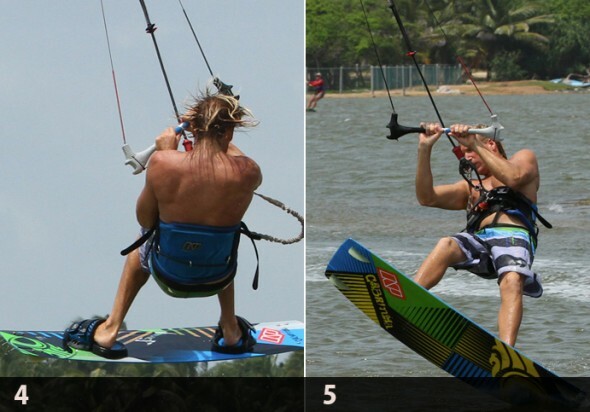 Although some warning words are here, if you’ve been practicing the double back roll kite loop from last issue, you may require to rewire your brain and press default as these are two clearly different moves wherein you definitely don’t wish to be confusing. A very good base before starting this is a solid and controlled, BLT, or back roll transition if you’re from across the pond. From this point below is what you will be doing. Vital 2 things to remember for any transition are; you have to kill some forward momentum and then you still need to send the kite for lift. You certainly require a good edge for both of these elements. From a good edge you can edge harder upwind to slow down, and with a good edge you can send the kite rapidly and sharply from either 11 or 1 to 12 o’clock because you maintain tension in the lines. If you think about this you won’t drift the kite up slowly whilst standing up on the board and your chances of success will be greatly increased. Please note and also see in Pic A that the rider has come in with good speed on a decent edge, kite at 11 o’clock, weight back and tension in his lines. From this point the rider has sent the kite up whilst edging harder to both resist the pull, and also to slow down. Even though his back leg is bent it is not soft – it is pushing and therefore resisting. A certain element of trial and error with good amount of practice is what required for this part, depending on your standard BLT. In case if you are a recognized exponent of slow, casual-looking back roll transitions then speeding up the rotation to accommodate an extra 360° shouldn’t hold much of a problem. If however you’re guilty of the occasional foray into spinney quick low BLTs, then you’ll need to focus more on your approach and the take-off, in search of more height and float, which added to your spin speed should see you nicely round the full double. 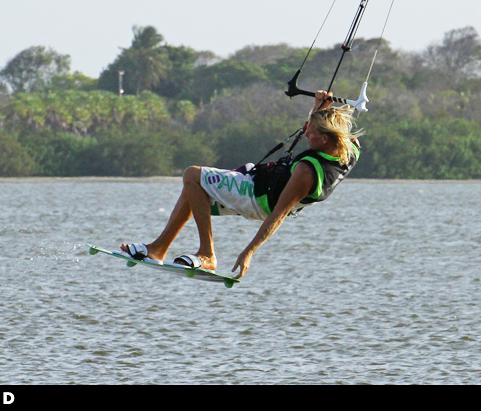 We feel it extremely important to mention here that that you do want to help yourself into the second rotation, but you don’t want to force it as later in the move you can use your head, body and kite to help you finish. The rider I Pic B. has dropped his weight way back over the tail of the board. With his weight so far back the board will turn/carve much further into the wind as it is almost pivoting on its tail. This will efficiently speed up the rider’s rotation as he will carve further into wind before take-off than for his standard BLT. The important tool here is timing, you must drop back as the kite starts to lift, a fraction before you take off. This way you’ll still edge and therefore be rewarded with some air and float. If you drop back too early you’ll be pulled back and the kite will fly further back in the window, offering you less time in the air to make it round the two times. Here comes the key moment, though your approach will dictate how this goes. If you have edged and resisted and literally stabbed the kite back hard but face short time you will be able to pop up off your back leg as you pull the bar in whilst the kite is somewhere close to 12 o’clock. The rider has pulled the bar right in after popping. The reasons for this are twofold. Firstly by pulling in hard with 2 hands the rider successfully stops the kite moving and keeps it centered above bias around 12 o’clock. Secondly he gets a cheeky bit of extra lift from the kite. However be cautioned if your sweet spot is trimmed miles away from you, your kite will flare/stall and you will not get the float or control that you’re expecting. As he takes off he keeps his head looking forward between his arms, which will stop him over cooking the rotation. Finally the rider in this image lifts his knees, making himself small, balanced and easier to rotate. Half Way House Pic D.
By the time you reach to the peak of your transition, your aim is to complete your first rotation, so one on the way up and then one on the way down. That means unless you’re getting great height there won’t be much time to separate the move into two halves. Your second rotation will come from a combination of your head and the kite. With your feet up look around and you’ll continue to turn and the rest will follow. You can see that the rider is attentive on where he will land, and as soon as he feels that he is rotating, he dives the kite down hard. The pull from the kite twists him around and powers him up for a down wind landing. One thing which really important is Timing here in this trick , but if you pull too early the kite will end up low with little power and as such you’ll be forced into a late kite loop once you have landed to keep you dry. If you time the dive well, you’ll get the perfect dry landing without needing to loop the kite. Start with some single BLTs, focused on the edge, send, upward take off and keeping the kite above you at 12 o’clock throughout the move. Once you’re comfortable, confident and consistent bring your feet up and go for the second rotation whilst keeping the kite at 12. Once this is in the bag you can dive hard to add the perfect 10 landing! If you’re struggling with the slow rotation, concentrate on the up rather than the spin and approach with less speed and more edge, whilst sending more aggressively – but just for a short moment. The most common problem here is implementation the move but landing with the kite so for at the edge of the window that there is no way to get any power to get moving. There are two probable reasons for this. Firstly you’re drifting the kite up rather than sending, so you feel the lift late and the kite has already travelled too far behind you. 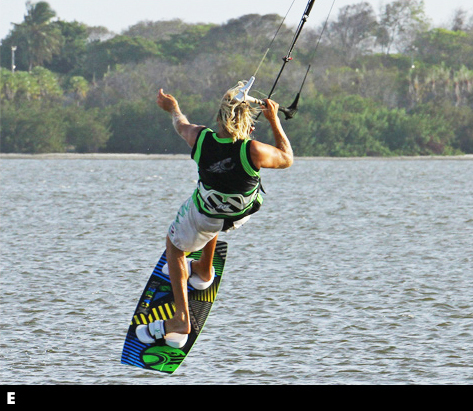 Secondly as you take off your leaning back onto your back hand, so you don’t stop or even redirect the kite to 12. Concentrate on performing the move with the kite at 12 o’clock and then add the kite dive on at the end. The other famous problem is not having enough height to land cleanly, so you are completing the double but always landing on an edge across the wind with your burn in the water. This can generally be linked with concentrating too much on the rotation and not launching yourself up into the move. Make an effort to pop up into the rotation, and not just carve around into the wind. Your box of tricks should be always full with surplus of moves; however you have to ensure that you keep up with the transitions too. Having more ways to change direction is never a bad thing so here is another one which will have you flying out gracefully with plenty of beans. 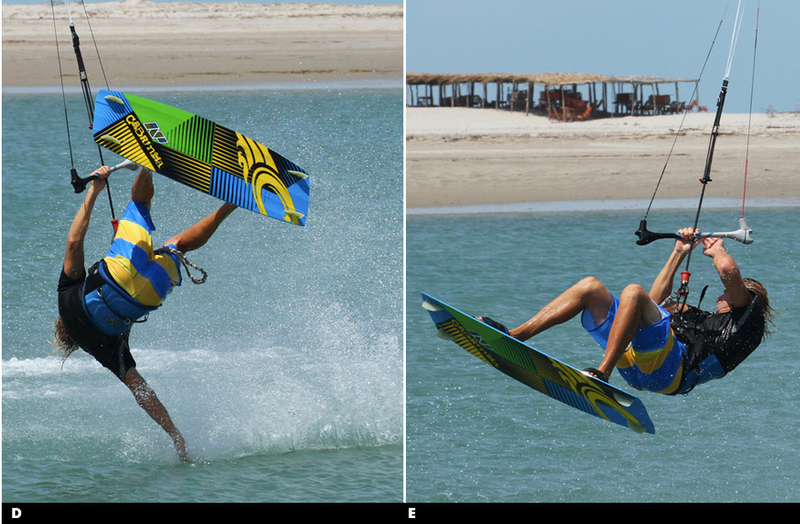 When you start doing this we will definitely recommend a controlled front loop from toe side and solid down loop. Let’s have a quick idea at a few pointers that will hopefully make the learning a tad simpler. 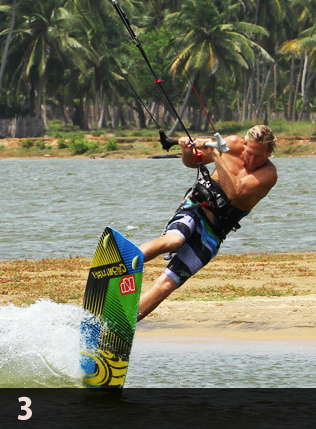 A huge height is not required for this, however some forward momentum and plenty of float is obligatory, so you’ll need to approach this more as a double front roll with speed and the kite parked at either 1 or 11 o’clock. You’ll be taking off from your toes and therefore trim is important, hence get your sweet spot down towards you. This way you will provide a decent committed edge and still have room to send the kite without stalling it. Your toe side stance needs to be solid in this position. In the image the rider has all of his body upwind of the board; both knees are bent and driving forward with all his weight firmly on both sets of toes, creating a decent rooster tail behind him. Once he gets sweet spot close in, he can get his shoulders and head committed upwind and the kite is not pulling him up onto the board. Take-off is very important in order to get enough height and time from your toes. Get it wrong and you’ll fly down wind and pendulum under your kite! In order to initiate your front rotation you need to get your weight back so that you can kick off your back leg and in order to go up you need to send the kite with a good push and pull from both hands. The rider has sent the kite with a decent bar action, and also keeping it on the sweet spot. If he pulled it in any further the kite will pull him up onto the board and he’ll lose his edge. The order of play here is to send the kite with both knees bent and then drop your weight back ready to kick off. You will lose speed and the ability to edge hard if you drop back too early. Roll With It Pic 3. Over here in this picture you can check that the rider only past the 360 degree mark. He has finished his first rotation whilst still on the way up and now starts his second. Having kept the kite close to 12 o’clock he has both float from the kite and he can feel where the kite is. You must commit to the second rotation so as soon as you come around the first continue to turn your head and go with the energy you created on take-off. If the kite is above you or even a little in front of you, you are in right place to well place to start the down loop. We propose two reasons to initiate it now. 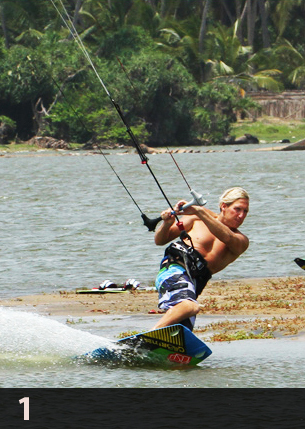 Initially the pull from the kite will help pull you around the rest of the way. And then secondly the earlier we pull, the less aggressive, relatively speaking, we need to be on the bar. 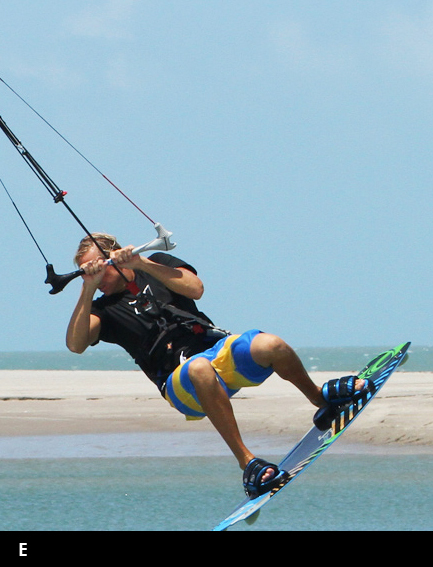 Your sits is for the kite to pull you out of the transition with speed and if the kite down loops too rapidly or from too far behind it will drop you down with no momentum. You can see in the images that the rider has his knees up tight, bar in close and his head is turned to rotate, all this will rooks hits turn faster. Looking at the bar you can see that he is already initiating the down loop. The moment of truth and another insight into the reason you must down loop early, gradually and continually. 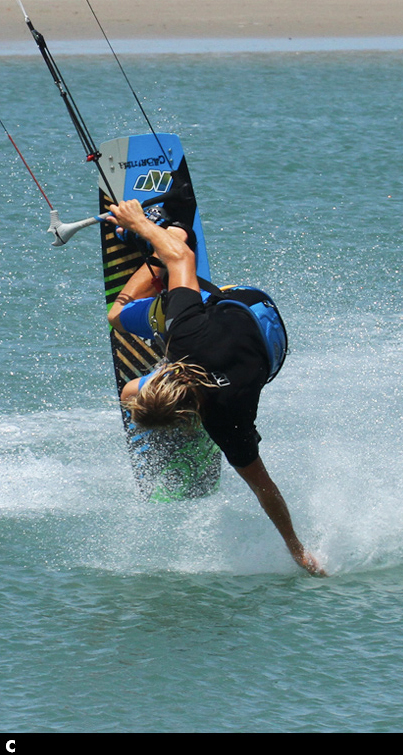 Looking at the rider in image you can see that he is landing right foot forward downwind on the tail of his board, all set to carve out of the “turn” and back onto his edge. Realistically he isn’t finishing 2 full rotations; it is more like one and three quarters. So not only does the down loop give you speed but it pulls you out of the rotation. If you initiate the down loop later you will effectively over rotate and land on your heel side edge, stopping all momentum and you in the process. In final stage the rider keeps pulling the kite through the down loop until it is back up at 1 o’clock in the right position to ride away. To start with aim to get the rotations and a finish down loop, as this will be better than under cooking it with the kite, so when you do pull on the front hand, pull hard. This will however often result in you stopping when you land. Once you’ve practiced that a bit and having read the previous pointers you can see that the aim of this move is not to perform a double rotation and a down loop in the air, but rather get your rotation and use the down loop to pull you out with speed. Essentially you will be finishing the down loop as you land, not before. To get your head around this try some air gybe down loops If you go early and hard the kite turns, goes back up to 12 o’clock and you sink. Your sits is to progressively turn the kite more gently so that it will go through the bottom of the down loop before you land but as it rises it will pull you through the landing and give you a good speedy landing. If you find that you cannot edge enough when sending the kite, and therefore get pulled too much downwind whilst in the air – trim. Even if you have gorilla-length arms you need that sweet spot and the bar in close. If you find that you land with no power, as discussed above, you need to get the kite just in front of 12 just after take-off and then down loop the kite more slowly. 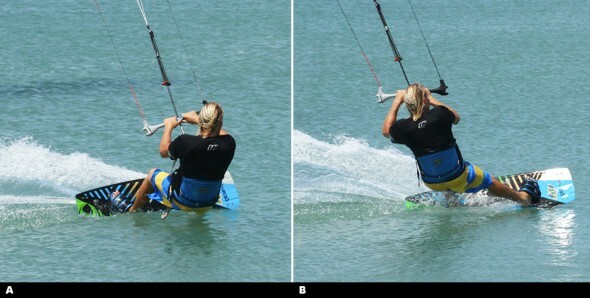 If you’re landing on your hip and can’t get the board underneath you, this is a sign that the kite is down looping too low, so make sure you haven’t redirected the kite too much after take-off, and be a bit more aggressive when you pull on the front hand to down loop it. Fast toe side with both knees driving forward. 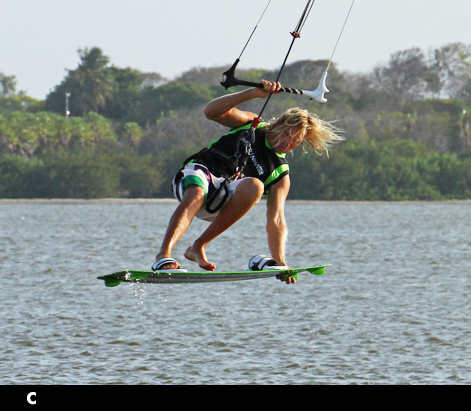 Before attempting to learn the front loop transition it is wise to first learn the air gybe. If you also know how to make a front loop, this should be a piece of cake for you. Here are the steps to complete a front loop transition. Approach as for a normal air gybe. Ditch some speed by carving hard into the wind and then immediately send the kite back aggressively, keeping the bar on the sweet spot. Keep your weight over your back foot, extend your front leg. As soon as you feel the kite lift, explode up your back leg and level the bar out by pulling both hands down towards your hips. Throw yourself into the front rotation by dropping your leading shoulder, turn your head and kick off the back foot. 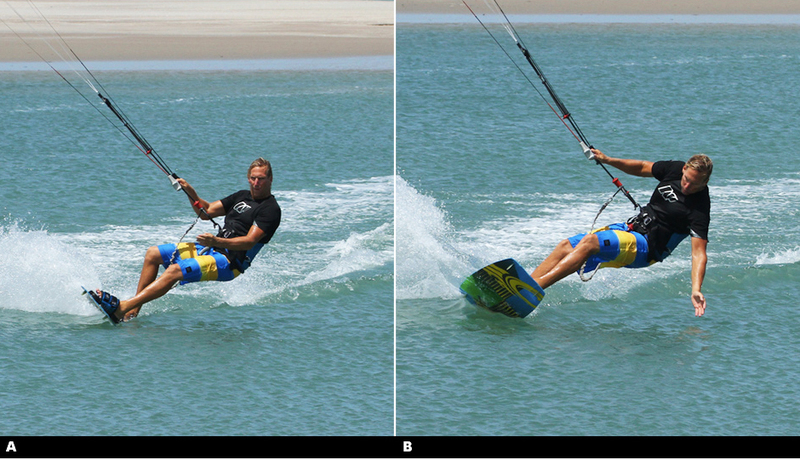 As you start to rotate redirect the kite with your front hand in order to get it back above you. Lift your knees, making yourself smaller to help the rotation and to keep your balance in the air. Keep the bar in so you can feel where the kite is and keep tension on the lines, which in turn keeps you up and floating. Look over your back shoulder and wait until you see a potential landing spot. With the bar still in you can feel where the kite is, and in this case it’s now above you so you level the bar out. Now at the apex of your jump keep the bar in so that the kite will be responsive once you need to dive it. Still look over your back shoulder, waiting to spot your landing.